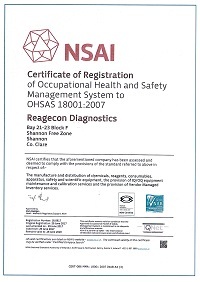 Because of the exacting nature of our business and the regulatory demands placed upon our industry, Reagecon continues to be at the forefront in terms of compliance, accreditations and certifications. The following list, although not exhaustive, provides information which should be of value to you as a partner. 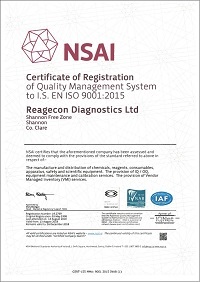 Certificate of Registration of Quality Management System covering the manufacture and distribution of chemicals, reagents, consumables, apparatus, safety and scientific equipment. The provision of IQ/OQ, equipment maintenance and calibration services. The provision of Vendor Managed Inventory (VMI) services. Occupational Health and Safety Management Certification is an international standard which provides a framework to identify, control and decrease the risks associated with health and safety within the worklpace.